For other uses, see DC Universe (disambiguation). "DC Animated" redirects here. For the feature films series also produced by Warner Bros. Animation, see DC Universe Animated Original Movies. An image of several DCAU heroes from the Justice League Unlimited episode "Dark Heart"
The DC Animated Universe (DCAU; also referred to as the Timmverse or Diniverse by fans) is the shared universe centered on a group of animated television series based on DC Comics, produced by Warner Bros. 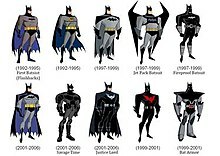 Animation from the early 1990s to mid-2000s; beginning with Batman: The Animated Series in 1992, and ending with Justice League Unlimited in 2006. Some parts of the associated media franchise including direct-to-video feature films and shorts, comic books, video games and other multimedia adaptations are also included in the continuity. Batman's various character designs from the DCAU; he has been the most-featured character in this animated continuity, due to being the star of the original TV series in the DCAU. While there have been several animated projects based upon DC Comics characters over the decades, what is commonly accepted as the DC animated universe consists of the stable of TV series and films that spin off from Batman: The Animated Series (1992–1995), the first TV show in this continuity. Two characters outside of the normal Batman canon, Zatanna and Jonah Hex, appeared on the show, but the first series to indicate a shared continuity with other well-known characters was the subsequent show, Superman: The Animated Series, in which the title character has encounters with heroes such as the Flash and the Green Lantern. Older shows such as Super Friends and newer shows such as The Batman, Legion of Super Heroes, Batman: The Brave and the Bold, Young Justice and Justice League Action are not part of this continuity. The direct-to-video DC Universe Animated Original Movies, such as Superman: Doomsday, Justice League: The New Frontier, and Batman: Gotham Knight are also not considered part of the DCAU, despite utilizing similar character designs and several of them featuring much of the same voice cast as previous DCAU series. An animated series based on the Teen Titans comic books was planned for the DC animated universe during the mid-1990s, but was finally scrapped. Instead a Teen Titans series not related to the DC animated universe was released. Also, after the success of Batman: The Animated Series in the early 1990s, Fox approached producer Bruce Timm to create a spin-off series focusing on Catwoman, but the project never materialized. Before the release of Batman Beyond: Return of the Joker, a third animated feature based on Batman: The Animated Series was planned, entitled Batman: Arkham. The film was supposed to be a follow-up for Batman & Mr. Freeze: SubZero, and Boyd Kirkland was attached to write and direct; but the project was soon scrapped. A second Batman Beyond movie was planned for release but was finally scrapped due to the dark tones and controversies of Batman Beyond: Return of the Joker in 2001. Around 2003, during the production of Batman: Mystery of the Batwoman, Warner Bros. approached Kirkland to write a Catwoman direct-to-video feature film as a tie-in with the 2004 live-action film. Although the script was written, the project was soon scrapped after the poor reception of the live-action film. Also, a direct-to-video feature-length animated film entitled Justice League: Worlds Collide was planned to connect Justice League with its follow-up Justice League Unlimited, but the production was finally cancelled in 2004, and the script was later rewritten for the animated film Justice League: Crisis on Two Earths, that was not part of the DC animated universe. The Dark Knight's First Night (1990) – A short film which acted as the developmental pilot for Batman: The Animated Series. Chase Me (2003) – A short film with no dialogue based on The New Batman Adventures. Batman Black & White: Two of a Kind (2008) - A motion comic adaptation of Bruce Timm's "Two-Face: Two of a Kind"
Mad Love (2008) - A 3 part motion comic adaptation of Bruce Timm and Paul Dini's "Batman Adventures: Mad Love"
Batman Beyond (2014) – A short film based on Batman Beyond created by Darwyn Cooke for Batman's 75th anniversary. The short features the original voice cast of the show, as well as cameos of robotic batmen from The New Batman Adventures, The Batman, Batman: The Brave and the Bold, Beware the Batman, The Dark Knight Returns, Michael Keaton's Batman, Adam West's Batman, and the original comic book Batman from 1939. Gotham Girls (2000–2002) – A Macromedia Flash web cartoon series, this was downloadable from the WB website, and featured DCAU versions of characters voiced by their original actors. A DC Comics miniseries inspired by the web series was released in 2004. All three seasons of Gotham Girls were released on the Birds of Prey DVD box set in 2008. Lobo (2000) – A Flash cartoon series starring Lobo, the galactic bounty hunter, the web-series is a spin-off of the Superman episode "The Main Man". A wax statue with the same character design as Lobo in this series appeared in an episode of Gotham Girls and he also made a reappearance in the Justice League episode "Hereafter" briefly becoming a member of the Justice League. Both of these examples somewhat support that the webseries is part of the official DCAU, although this is still disputed. Unlike the other cartoons set in the DCAU, it has graphic violence, sexual content and strong profanity. Five of these games feature voice acting from the casts of the original shows. These are: The Adventures of Batman and Robin (SEGA CD/Mega CD version), Superman, Batman Vengeance, Superman: Shadow of Apokolips, and Batman: Rise of Sin Tzu. The SEGA CD/Mega CD game, The Adventures of Batman and Robin, also features animation from one of the studios that animated Batman: The Animated Series. Clive Revill, Efrem Zimbalist Jr. Efrem Zimbalist Jr. Efrem Zimbalist Jr. Efrem Zimbalist Jr. Efrem Zimbalist Jr. Efrem Zimbalist Jr.
2005 Krypto the Super Dog #1-6 Artist Min S Ku draws many characters in their DCAU style. 2014 Adventures of Superman #40 The Joker shows up in multiple styles, including his New Batman Adventures look. 2017 Action Comics #975 Mr. Mxyzptlk and Superman appear in their Superman: The Animated Series style. In addition, the backstory of Mr. Freeze was adapted from his portrayal in Batman: The Animated Series, and the visuals and/or characterization of Green Lantern, Supergirl, Toyman, Two-Face, Parasite, Metallo, Clayface, and many others have been applied to their comic counterparts. On a different note, issue #22 of DC Comics' Superman/Batman series, which explores alternate realities, had Bizarro transported to an alternate version of Gotham City patrolled by a Batman using the Batman Beyond version of the costume. A version of the future of Batman Beyond made an appearance in Countdown to Final Crisis #21, as part of the new Multiverse in the wake of the Infinite Crisis and 52, and a Batman Beyond series is planned. In January 2015, DC published The Multiversity Guidebook which revealed that a universe inspired by the DCAU is Earth-12 in the DC Multiverse, and currently in the Batman Beyond era, while the Justice Lords Earth from the Justice League episode "A Better World" has also been added to the canon as Earth-50. With the conclusion of the Justice League Unlimited animated series, Warner Bros has moved on to adapting new versions of the various DC comics properties rather than reviving the DCAU counterparts. The last script written for DCAU continuity was titled Justice League: Worlds Collide. This screenplay was created to bridge the several month gap between Justice League and Justice League Unlimited. The draft was eventually adapted into the February 2010 film Justice League: Crisis on Two Earths, with the removal of any references specific to DCAU continuity, replacing Green Lantern John Stewart with Hal Jordan, and the casting of different voice actors than those of the DCAU. I very much appreciate that so many of you guys have so much love for the old series, from BTAS through JLU (I do too) -- but frankly, I doubt that we'll be formally, "officially" doing another movie or TV series set in that continuity (...) anything is possible, so conceivably that could change someday -- instead of saying "THE DCAU IS DEAD", maybe we can just say it's in a state of suspended animation until further notice...? On June 8, 2015, during an interview with Nerdist about his new film Justice League: Gods and Monsters, Bruce Timm was asked if the DC animated universe will return someday. Although Timm stated that the DCAU continuity was unlikely to return, the possibility always exists. In 2018, Kevin Conroy said work on the DCAU had stalled because the writers ran out of ideas for stories and believed stopping was best, as they did not want to "compromise on the quality of what they had and start creating kind of silly stories". However since 2018 a new DCAU film has been released in the form of Justice League vs. the Fatal Five, however the film had started out as being in continuity with the universe of Justice League: Crisis on Two Earths and not in the DC Animated Universe before the scipt and animation style was edited for it to become a DCAU film. Bruce Timm also stated during WonderCon 2019 at the premiere of Justice League Vs. The Fatal Five that more potential films set in the Justice League Unlimited could be made if the film sells well enough. The Batman Beyond comic series is a loose adaptation of the Batman Beyond franchise, intended to fit the character and storylines from the series into the mainstream DC continuity. The miniseries began in June 2010, under the title Future Evil. In August 2010, the series was announced to continue following the completion of the first arc as an ongoing series. That series concluded alongside the entire line of ongoing monthly DC Comics superhero books during the 2011 revamp and relaunch, titled The New 52. Superman Beyond, a one-shot comic set in the same universe as Batman Beyond, was released in 2011. Batman Beyond Unlimited, a title chronicling the adventures of the future Justice League introduced in the DCAU, was released in February 2012. This series published monthly triple-sized issues, containing three stories of Terry McGinnis, Clark "Cal" Kent, and the future Justice League Unlimited, respectively. Batman Beyond Universe succeeded Unlimited in August 2013, condensing to double-monthly issues upon the elderly Superman's rejoining the future Justice League. Terry McGinnis was the central figure in The New 52: Futures End weekly series. In 2015-2016, DC Comics and IDW Publishing released a jointly produced, six-issue miniseries comic titled Batman/TMNT, where the New 52 Batman encounters the IDW incarnation of the Teenage Mutant Ninja Turtles. The success of this miniseries inspired a similar crossover story, with Batman's DCAU incarnation meeting the Amazing Adventures comic version of the 2012 CGI series' Turtles. The concept was first announced in late July 2016, and is scheduled for a six-issue release starting November 9, 2016. ^ "A History of Batman on TV". IGN. Retrieved August 15, 2010. ^ "The Greatest Comic Book Cartoons of All Time" Archived May 29, 2012, at the Wayback Machine. IGN. January 26, 2007. Retrieved May 31, 2011. ^ "Top 25 Animated Movies of All-Time". IGN. Retrieved October 10, 2012. ^ "Batman: Mask of the Phantasm". Rotten Tomatoes. Flixster. Archived from the original on January 30, 2008. Retrieved January 21, 2008. ^ "Two-Face #0". Comic Vine. Retrieved May 7, 2017. ^ "Claritin Syrup Presents". Comic Book Database. Retrieved May 7, 2017. ^ "Gotham Knights". Comixology. Retrieved May 7, 2017. ^ "JLA Burger King Mini". Comic Vine. Retrieved May 7, 2017. ^ "SCOOBY-DOO TEAM-UP #12". DC Comics. Retrieved August 8, 2016. ^ "Love is Love". Previews World. Retrieved May 7, 2017. ^ "Harley Quinn". DC Comics. Retrieved May 7, 2017. ^ "Superman: Game Boy: Video Games". Amazon.com. September 21, 2013. Retrieved May 14, 2014. ^ "Green Lantern History: An Unauthorized Guide to the DC Comic Book Series". google.com. Retrieved June 15, 2017. ^ Timm, Bruce (September 18, 2009). "Justice League: Crisis on Two Earths News & Discussion". Toon Zone. Archived from the original on June 13, 2011. Retrieved June 15, 2017. ^ "Interview: Bruce Timm Talks JUSTICE LEAGUE: GODS AND MONSTERS - Nerdist". June 8, 2015. ^ Bonomolo, Cameron (May 27, 2018). "Kevin Conroy Reveals The Real Reason They Stopped Making 'Batman: The Animated Series'". ComicBook.com. Retrieved May 27, 2018. ^ "Batman Beyond To Receive An Ongoing Series". Inside Pulse. August 28, 2010. Retrieved January 3, 2011. ^ "DC Comics Launches Batman Beyond Unlimited". DC Comics. November 14, 2011. Retrieved May 14, 2014. ^ "DC Comics' FULL June 2013 Solicitations". Newsarama. Retrieved July 14, 2013. ...don't miss the epic conclusion of Superman Beyond! ^ "DC Comics' FULL August 2013 Solicitations". Newsarama. Retrieved July 14, 2013. ^ Press, Official (July 22, 2016). "The Classic '90s Cartoon Batman Is Teaming Up With the Ninja Turtles for a New Comic". io9.com. Retrieved July 23, 2016. ^ Press, Official (July 22, 2016). "Animated-style Batman/Teenage Mutant Ninja Turtles crossover announced". Batman-news.com. Retrieved July 23, 2016.